As a dedicated developer working part time and going to school full time, I can't be at my home computer whenever I think of new ideas or new ways to go about designs. "Just the other​ day, I was thinking up a new algorithm that involved some math equations when I had to leave for class. I was meeting for a study group soon after, but had some spare time. So, I started writing down my algorithm on paper. Curious to see if it would work, I hopped onto the school computer, downloaded Hello in less than 5 minutes, and started typing the equations I needed on my own app without setting up a development environment. My algorithm worked, and I felt relieved to be able to solve the problem without even being home. It was shortly after that I was able to sit down peacefully to study, knowing that I finished the task that was in the back of my head all day, all without leaving the library. Later that night, I hopped onto my home computer, where the algorithm was already transferred from the school computer to my personal computer." That's why Hello is very useful on the go. "I was going on a family vacation. I got bored of scrolling through social media and I saw my friend was building an app. He asked if I could help him with a few graphics, since I love to draw. I downloaded a pixel design app on my phone, made a few sketches, then downloaded World of Hello and uploaded my drawings from my phone. Right as soon as I saw my drawings appear on my friend's app instantly, he messages me with some critiques, since I'm always looking to get better. I made a few adjustments to my drawing, then re-uploaded it. We could both see it appear in action at the same time on his app, it was super cool." Without Hello, it would be a huge hassle getting on some temporary computer and setting up your development environment to be identical to your home computer's environment. Not to mention you couldn't even do that straight from your phone. Similarly, you wouldn't be able to see real-time results as you upload graphics and make code changes -- your friends would have no idea what updates you've made. "I have no idea how to code, and I was never very good at doing things like drawing. But I am very good when it comes to being in charge and being a leader. I had a good idea for an app, so I put together a group from all over the country. Hello made it easy for me to manage my team, and I was able to see instant progress as they developed my vision. What I liked most is that we didn't have to do screensharing or voice chat, we could communicate directly through Hello." Luckily for you, I've been there -- having a great idea, but no way to try it out until I got home several hours later. Whether you're on the go, have a team across the country, or an individual seeking money and happiness through starting your own company with an app, World of Hello is perfect for you. I'm so excited to share my journey with you, as we all have taken different paths to get where we are together, whether it be in development or not. ​Are you a developer? Comment with your story on how you got to be where you are today. 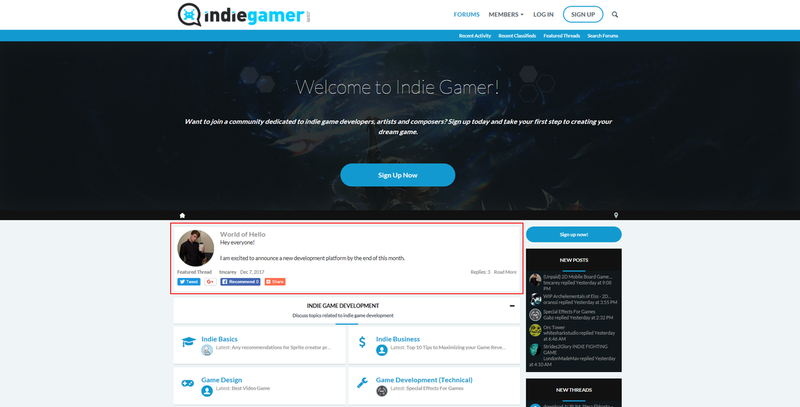 Today, World of Hello was featured on the popular game development website, IndieGamer. ​Although this might not be a huge accomplishment to some, I've worked very hard on Hello and getting any awareness out there makes me super happy. Here you can view articles I've written on various experiences and topics.